I purchased a box of this popcorn yesterday for $1. Read to find out what I thought of it. Product Description: Microwave popcorn from the Snappy brand offering movie theater-style butter and the promise of being 100 percent whole grain. 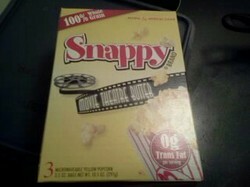 I purchased a box of this popcorn (containing 3 bags) at one of our local grocery stores yesterday evening for $1. My wife and I popped a bag of it last night while sitting on the couch catching up on some of our favorite television shows. I rarely make special trips to the grocery store over something like this. However, I was actually in the mood for popcorn yesterday afternoon and, realizing we didn’t have any in the house, made a detour on my way home from work. My primary reason for purchasing this particular brand of microwave popcorn was the price. I still had a couple days before payday and money was starting to get tight. As a result of that, I went into the store looking for something I could purchase on a budget. This brand, which was located in the store’s dollar section, was easily the most affordable at $1.06 after tax. Other brands, in comparison, would have cost me at least $2 more. Mostly because of the low price, I did have some doubts about this particular brand of popcorn. Part of me was concerned about overall quality while another part of me wondered if I would have issues with the bag not venting properly (something that has happened before with bargain brands and always results in the popcorn burning). As it turns out, this was not a problem. First of all, the popcorn popped normally. I didn’t have any issues with it not venting and the popped corn filled the bag. The latter was something that was honestly a little surprising since even some of the more expensive brands don’t always get filled to the top. Needless to say, I was impressed by that, especially since it only took about 90 seconds. Another thing that impressed me about this popcorn was the taste. It probably could have used a bit more butter (it was buttered but there was nothing that gave me the whole “movie theater butter” feel). However, it had a pleasant flavor and, unlike many other bargain-priced brands, wasn’t too salty. In fact, I think this popcorn was easily as enjoyable as some of the better known and more expensive brands that are out there. This was a bargain-priced brand of microwave popcorn that more than exceeded my expectations. Now that I had a chance to try it, I have every intention of purchasing it on a regular basis. Overcoming children that are very picky about what they will eat.